COX 41004 Chilton 10.3 ounce cartridge rotating cradle caulk gun is designed to outlast those caulk dispensers that are found at the hardware and big box home improvement stores. 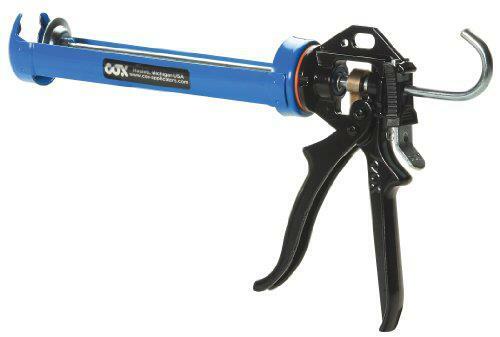 This caulk gun's body is constructed of a heavy duty die-cast zinc alloy to withstand years of use. The caulk flow is 12:1 which is adjustable depending on your preference. This caulking tool comes with a wear compensating device, a built in ladder hook for both convenience and safety and also a sintered steel catch plate. Although the COX model 41004 caulk gun is economical in price, it is definitely well constructed and has received many positive reviews for its stamina and workability. It works quite well with low - medium viscosity silicone sealants, polyurethane sealants and adhesives.